Normally SR-71 pilots weren’t a chatty bunch, but I could hear the anxiety in the voice of this one. In 1972, more than 50,000 troops were stationed throughout 32 U.S. military bases in Okinawa, Japan. Kadena Air Base, with two 12,100-foot runways, was their gateway to Southeast Asia. In the wake of the Quang Tri massacre, which occurred when North Vietnamese forces captured that South Vietnamese provincial capital, Kadena’s activity level was balls to the wall. As an aircraft maintenance technician there, you did as much as you could as fast as you could for as long as you could. And sleep? You got it when and where you could. Kadena’s parallel runways divided the base. My outfit, Military Airlift Command, was on one side. The other side was used by Tactical Air Command and Strategic Air Command. MAC “turned”—refueled and, if needed, repaired—the C-141s and C-5s that were hauling supplies into and out of the Vietnam theater. Lots of ammo went in. Lots of bodies came out. Most returning flights carried a few. Randomly an aircraft would have just one, or none. But I saw airplanes full of caskets, and you never forget that. On the other side of the runways, SAC launched tankers in support of the B-52s en route from Guam to Vietnam. In those days the tankers still had loud turbojet engines that produced gobs of smoke, made worse by the 630-gallon water injections each KC-135 used on takeoff, creating a two-mile cloud of black fog trailing each flight. During the 1972-1973 “Christmas bombing” of Hanoi, the tankers would take off from Kadena in four flights of four: Sixteen KC-135s at a time, packed tight. You’d have to have seen it to believe it. Amid all that activity, occasionally a quiet would descend on the base: An SR-71 Blackbird was about to appear. Kadena and the airspace around it had to be secure. The spyplanes were housed in four hangars in the SAC area and never parked outside for the rest of the world to see. To launch, the SR-71 would start its engines inside the hangar and, flanked by an entourage of trucks, creep its way to the end of the runway. After final prep and checks at the runway’s threshold, the trucks would back off. Then this quiet, purring monster would let out a roar that seemed to drown out the world, then shoot down the runway as if it were fired from a gun. Lifting its nose to a 45-degree angle, it would disappear from view in less than 10 seconds. I witnessed dozens of launches, every one of them as spellbinding as the first. An SR-71 coming in to land was another show entirely. Upon touchdown the nose would stay pointed in the air for a long time. Eventually, a giant orange drag chute would emerge and, at least 25 yards behind the airplane, fill out with dreamlike languor. Only then would the nose gear descend gently to the surface. On the afternoon of July 20, 1972, I was in my maintenance truck, eavesdropping on the tower frequency. Word had gotten around that an SR-71 would be landing soon. Normally the Blackbird pilots weren’t a chatty bunch, but I could hear the anxiety in the voice of this one. I heard the tower warn him of a 90-degrees-to-the-runway crosswind of 35 knots gusting to 50 knots—a typhoon was on its way. I could’ve sworn I heard the tower advise him to consider an alternate airport. But landing anywhere else was out of the question. 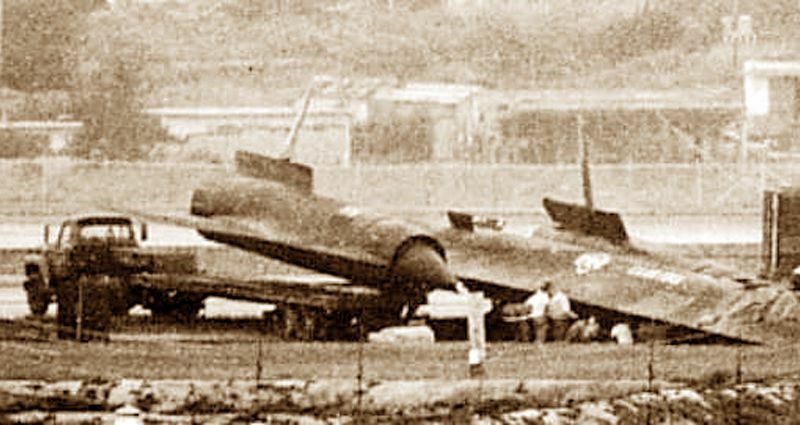 The SR-71 wouldn’t have had the fuel, and everyone understood without discussion that the brass wanted that airplane on the ground and out of sight as quickly as possible. I sought out a good vantage point to observe the landing: a small concrete building, which housed fuel pumps, about 50 yards from the runway the SR-71 was headed for. I climbed to the roof and settled in. I could see the landing lights before I could make out the airplane, perfectly lined up with the runway, three or four miles out. I couldn’t have been more focused if I were landing the damn thing myself. The main landing gear touched down, and despite the hellish crosswinds, the fuselage was aligned perfectly with the runway’s centerline. It looked like the pilot was going to pull off a picture-perfect landing. But as soon as he deployed his drag chute, a wind gust blew it to port. I watched the nose shift to starboard. Then one of the left main landing gear tires exploded. The pilot jettisoned the chute, poured the coals to the burner, and rotated away from the runway, climbing back into the sky to circle around. I remember thinking, What the hell is he gonna do now? No drag chute. Blown tire. And a monster crosswind, increasing by the minute. Fortunately, an incoming or outgoing SR-71 had the entire base to itself. The pilot made a second approach, dumping fuel the entire length of the runway, then came back around for his final. As he touched down, a fireball engulfed the left landing gear. The airplane kept rolling, nose still high in the air, and then the right gear tires blew. The Blackbird skidded past me like that, nose up and tires on fire, for four or five seconds. When the left gear collapsed and the wing struck the runway, the left engine exploded and debris flew high into the air. The entire airframe began to spin, still traveling down the runway at probably 150 mph, and finally the right gear buckled. The flaming wreck continued sliding down the runway, still on the centerline, until it finally drifted off to the left, into the grass. It came to rest about two-thirds of the way down the runway, about 4,000 feet from where I stood watching, jaw agape. Five hours later, the typhoon was upon us. Nothing moved at Kadena for three days. Once the weather returned to normal, a recovery crew began trying to lift the top-secret wreckage onto the back of a flatbed truck with a giant crane. The earth was so saturated that instead of the airplane coming up, the crane sank into the mud. About a month later, I saw the fuselage being loaded into a C-5 headed Stateside. Forty-three years later, I still don’t understand why getting that SR-71 inside while a typhoon was bearing down on us was so important. But those decisions were made far above my rank. Jody Liliedahl, a well-traveled writer and photographer, lives in Monterey, California.